Portland Stone. Based on my first Mayan Pelican (see below), I decided to make something that would stand up to the rigours of erosion and therefore selected a piece of Portland stone. It’s a very hard stone to work and it took several months to complete. The mount was made specially from welded stainless steel, which will add to its longevity and the plinth from a recycled pitch pine beam. Soapstone. I have recently become interested in war memorials. Although they are common-place in London, I was intrigued by the recent work of historian, Dr Alice Kelly, looking at contemporary meaning in these now-familiar objects. This piece, carved from Serpentine, is designed to reflect the experiences of those who did survive, but were permanently affected by “shell-shock” (or PTSD as we know it today). Soapstone. 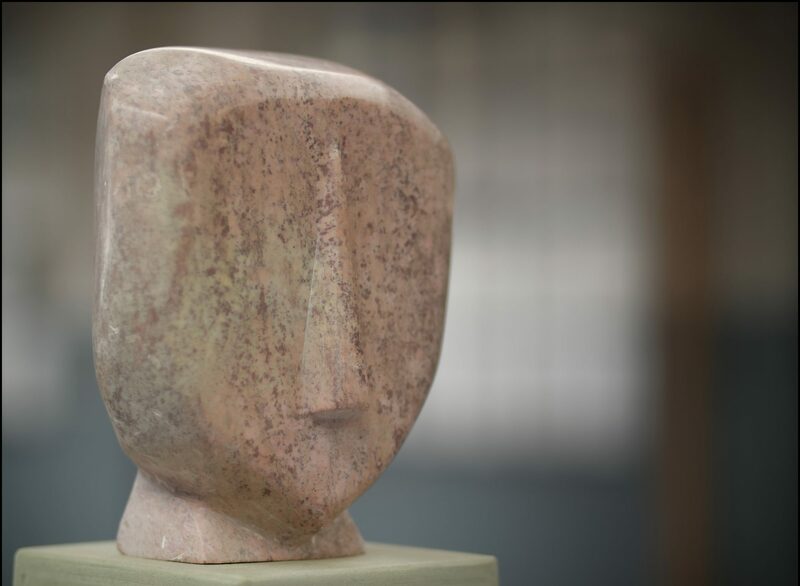 This is an adaptation of a Cycladic head, carved from a pinkish speckled Spanish soap-stone. I am very pleased with the simplicity and the clean lines of this abstract head. Limestone. The Pelican has long enjoyed mystical significance in cultures as diverse as early Mayan civilisations and Western European Christianity. This Bath-stone piece was inspired by a late Mayan Pelican stone hacha (circa A.D. 550-950), which sold at Sotheby’s in 2016. Bath-stone is fairly soft allowing it to be carved and polished using hand-tools. The nape was shaped using an adze and I have left this part rough to suggest the appearance of feathers. Limestone. This piece is an exercise in “bonsai stone-masonry”. It is a rendering of the 500 year-old gateway at Corpus Christi College, Oxford. The gateway separates the chapel cloister and a little garden. The material is Bath-stone. This now sits in a private library in the United States. Limestone. River-gods have long been central themes in European sculpture, dating from Roman Times. I wanted this one to celebrate the River Thames which flows about a mile away from where I live. This is carved from Bath-stone. Limestone. This expressionless head rests on a rounded pillow. It expresses that momentary tranquillity. It is carved from Bath-stone. Alabaster. The inspiration for this abstract piece was a pair of cupped hands. I toyed with the idea of inserting a polished glass sphere in the middle, but decided that I would leave this free for the eventual owner to place a treasured memento. Alabaster. Power of the sea. Inspired by Hokusai. Made from a bit of “scrap” Alabaster found on a beach. Made for the person who found the Alabaster on the beach.